Battling to stave off a second defeat for the unpopular deal, May also implored the EU to help her make “one more push” to get the agreement through a skeptical Parliament. In a speech to factory workers in the staunchly pro-Brexit northern England port town of Grimsby, May said a delay could lead to “more months and years arguing” over Britain’s departure from the EU. “If we go down that road, we may never leave the EU at all,” May told workers at a Danish-owned wind-power factory. “It needs just one more push to address the final specific concerns of our Parliament,” she said. 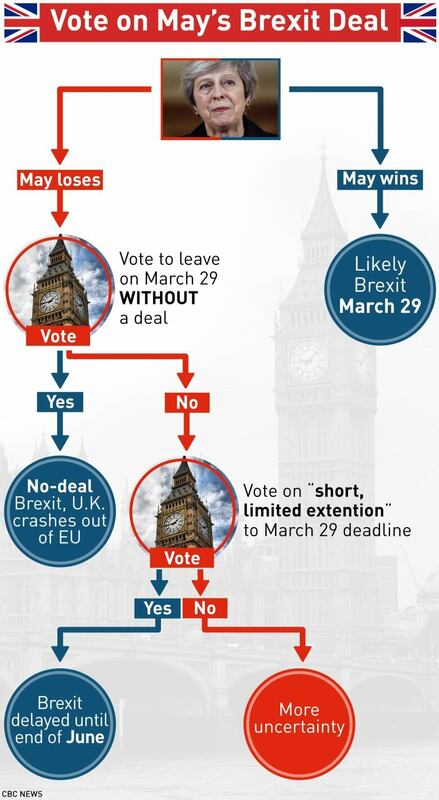 May acknowledged that even if her deal passes next week, time will be tight to pass the necessary legislation needed to make Brexit a reality on March 29. “If we were simply asking for a bit more time to pass the legislation we need to implement Brexit once we have agreed the deal, a delay would be straightforward,” she said. The EU is frustrated at what it sees as the inability of Britain’s divided government to lay out a clear vision for Brexit — and for seeking changes to an agreement that May herself helped negotiate. Dutch Prime Minister Mark Rutte expressed concern that Brexit was rapidly approaching without a deal, and said he would speak with May on Friday evening. “The Brexit date is getting ever closer. The ball is still rolling toward the cliffs of Dover,” Rutte told journalists. Rutte said May’s plan to amend the withdrawal agreement to secure parliamentary approval was unclear, and that he did not understand what she had meant when she said on Friday that only “one more push” was needed to reach a deal.